Read a summary and review of this book. Click on subject links to enhance and enrich the curriculum. The sport of rodeo has a vocabulary all its own. Define rodeo words and find-out how the rodeo got started at Texas Monthly Ranch Magazine. The first cowboys were Mexican men that took care of cattle. Read a brief history of cowboys in America. At the Word Ranch Activity Page, decide how many syllables are in each cowboy word. Did you know that a horse's height is measured in "hands?" Use your "number sense" to figure-out just how tall the horses are on the Measuring-Up Activity Page. Take a look at the beautiful wildflowers of Texas. Many Native American legends include wildflowers because of their brilliant colors. The nine banded armadillo is a fascinating creature. The species was first reported in Texas in 1854. Did you realize that armadillos are the only mammal that regularly give birth to quadruplets? Horses are amazing animals. Explore the Horsefun web pages. Solve a few horse puzzles and master the horse facts. When you think you are ready, take the Horsefun test. Texas Trivia - Discover interesting facts like the state small mammal and the favorite Texan dish. Test your knowledge by taking a multiple choice quiz on Texas official facts. Enjoy the melody and lyrics to the song "Deep in the Heart of Texas." The Texas Two Step is a popular partner dance. Get a friend to practice the steps. 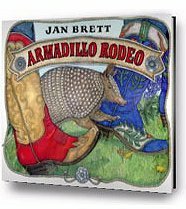 Jan Brett will show you how to draw an armadillo. All you need is a pencil and paper.